As a busy parent, I know you don’t have oodles of time to browse the bookstore (in our dreams, right?). That’s why I’ve developed a quarterly book box club. Every three months, your child is delivered a box of brain-boosting books and activities to keep them engaged and learning. You can select the books in your shipment by creating a wish list or leave it your book lady (me!). Q: What books are included? A: You can create a wishlist online to receive a random assortment of titles or you can let me know your child’s age and interest and I will pick out the books for you. 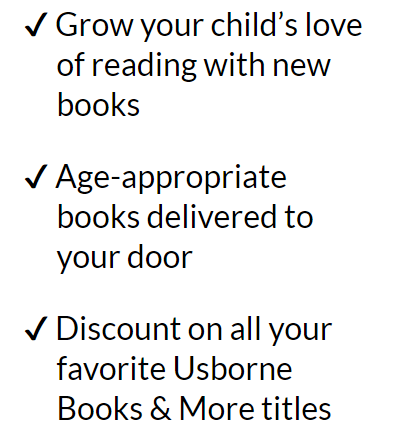 All books are selected from the Usborne Books & More catalog. Q: How many books are in each box? 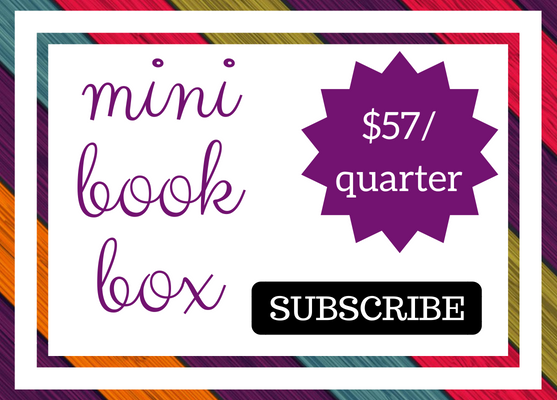 A: Most Mini Book Boxes average 6-9 books. 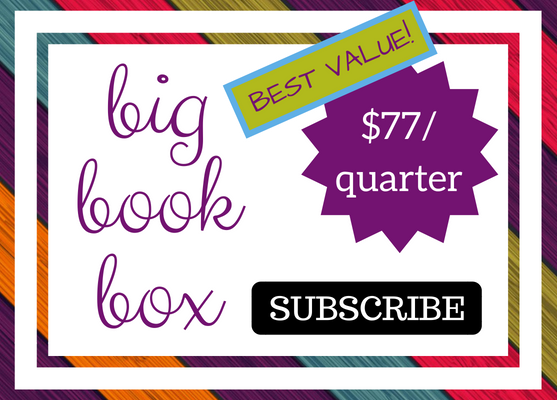 The Big Book Box averages 8-11 books. Of course, it depends on special requests, the price of wish list books and the age of the reader. For example, chapter books are priced lower than picture books so you’ll get more of those! I promise this is a great value and being in the club has its perks. Shoot me an email if you’d like specifics. Q: Can a book box be gifted to a child? A: Yes! This is a great option for birthdays, holidays and just for fun. You quickly become the favorite grandparent, aunt or uncle! Be sure to specify the mailing address when joining the club. 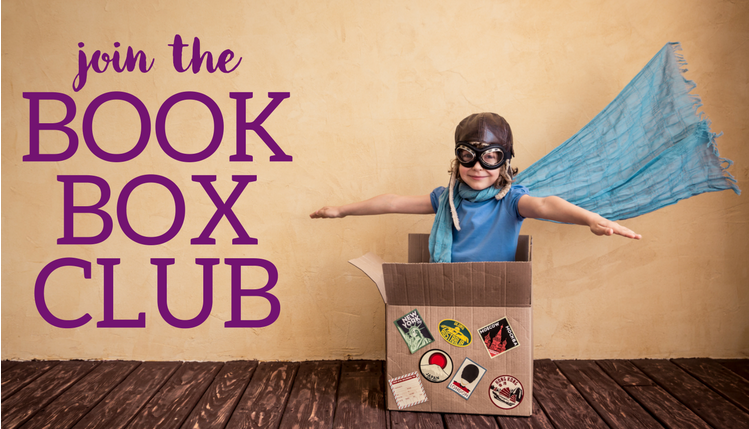 Q: What are the other perks of being a book box club member? A: As a member of the club, you’ll receive a welcome gift with a branded cinch bag and bookmarks. I like to spoil my book box club customers. You’ll also receive exclusive offers for being in the club. Q: Can I order for siblings? A: Yes, of course. You can create wish lists for each child or the box can be split among siblings. If you would like to order a box for each child, you receive $10 off your second box. Q: After I sign up, what happens next? A: I’m so excited you’re in the club! After you sign up, you will receive an email confirmation with a link to complete a short, book box club questionnaire. This will allow you to share more about the children receiving the books so I can help you find the perfect books for the kids in your life. Q: When will the books ship? A: You’ll receive your box quarterly. The books typically ship within 10 days of your billing date. Check with me if you would like your tracking information. Q: Will my credit card be charged automatically? A: Yes, your credit card will be debited quarterly for your book box club subscription. A: Yes, you can. We hope you’ll love your book box and stay in the club. Cancellations need to be submitted via email to laura@getbusyandread.com at least 4 weeks in advance of the next shipment.